Focus of the present studies was to synthesize a novel pH sensitive and thermoresponsive hydrogel which may show swelling behavior suitable for drug delivery at colon part of body. For this purpose, starch was copolymerized with methyl-3-aminocrotonate through free radical polymerization. The structural and thermal characterization of wheat starch/methyl-3-aminocrotonate hydrogel was carried out by XRD, FTIR and TGA. FTIR and XRD confirmed successful formation of the gel. Thermal data were further subjected to the isoconversional method for the determination of kinetic triplet (activation energy Ea, frequency factor A and g(α) function) to predict mechanism for thermal degradation of the synthesized gel. The first step showed a complex mechanism of thermal degradation, i.e., A2 followed by A3/2. Thermodynamic parameters ΔS* and ΔG* were also calculated. Moreover, swelling investigations unveiled these gels to be pH sensitive and thermoresponsive. The swelling percentage markedly increased with increasing pH and temperature. 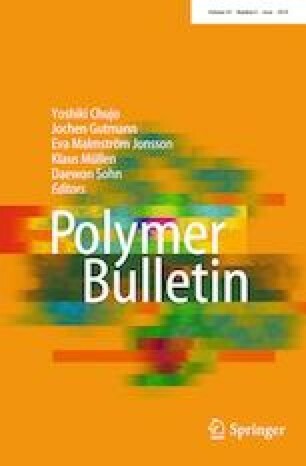 Kinetic order of swelling, diffusion mechanism and network parameters (i.e., molecular weight between cross-links and volume faction of polymers) of the synthesized hydrogel was also determined.